So the great battle of this summer’s free agency is over as a former number 1 draft pick, the elusive skilled big man that every franchise seeks but rarely finds, settled on a new home after a period of indecision. The marquee free agent of summer 2013 was of course, the “other” former no.1 big man, Dwight Howard, whose alleged indecision over his free agent move to Houston was more a product of Chris Broussard’s guesswork and total lack of journalistic integrity rather than reality. The real prize for the reigning champion Miami Heat, however, was the $1m per season signing of Greg Oden, the no. 1 overall from the 2007 draft. Oden was apparently picking between Miami, San Antonio, Memphis and Dallas, among other sides. His indecision was more a product of nearly four years of inactivity in professional basketball. Oden has played the fewest NBA games of any draft pick since 2007, a mere 82 games, or one full regular season. He only appeared in the 2008-2009 and 2009-2010 seasons after missing his entire rookie campaign following microfracture surgery on his right knee. 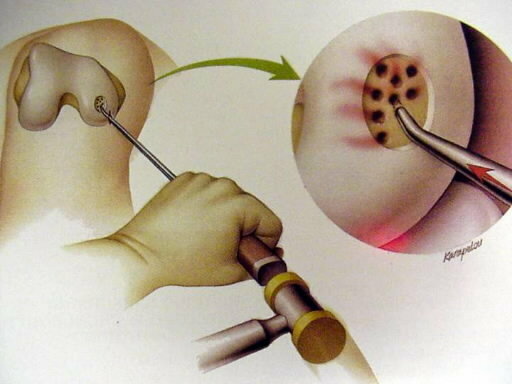 For those of you who don’t know, microfracture surgery is a procedure designed to replace absent or damaged cartilage in a joint, typically the knee. It is called “microfracture” because tiny holes (fractures) are drilled into the bones of the leg at the knee joint in order to form clots which turn into a form of cartilage, effectively scar tissue that provides cushioning for the knee joint. Among the NBA stars to have the procedure are John Stockton, Andrew Bogut, Jason Kidd, Amare Stoudemire, Tracy McGrady and Chris Webber. Some, like Stockton or Kidd, or even Kenyon Martin, have been able to regain something close to their old form. Others, like Ron Harper, Webber or Allan Houston, have not. Jamal Mashburn had to retire after he failed to recover from the procedure. Oden has had three microfracture surgeries. He also fractured his patella at the end of 2009, an injury that has curtailed his professional career to date. Mere days before suffering the injury, he recorded career highs in points (24) and rebounds (20) in separate games. The Portland Trailblazers, who gambled on Oden over the highly touted Kevin Durant in the 2007 draft, finally gave up on him and waived him in 2012. History might record this as a mistake alongside that of Sam Bowie, another Portland draft pick, taken ahead of a highly touted guard (one Michael Jordan) who suffered injury problems and never became the player he might otherwise have been, but we should not forget, as we shouldn’t in the case of Bowie, that Oden vs Durant was a legitimate debate in 2007. Oden had led a strong Ohio State squad to the 2007 NCAA Championship game where he recorded 25 points and 12 rebounds in a defeat to Florida. Oden remains a seven-foot-tall, 285 pound center. He will undoubtedly lack some of the mobility that made him a number 1 overall draft pick. He might even lack the ability to stay healthy for a full season – his former team-mate Brandon Roy recently attempted to overcome similar knee issues to return to the NBA after a year out with the Minnesota Timberwolves. Roy was unable to do so, albeit Roy was at his rookie-of-the-year, all-star best as a dynamic shooting guard, not a big man. Sam Bowie, too, struggled to stay healthy during an eleven year professional career, having played through a stress fracture in his leg as a collegiate star at Kentucky. The key issue for Oden is that he does not have to come in and be a franchise player, nor is he expected to. Oden’s Miami Heat career, in whatever shape or form it takes, will be as a role player. The Indiana Pacers have reloaded over the summer to the extent that they have been credibly touted as possible NBA finalists. Retaining David West in free agency, returning Danny Grainger from injury and bringing in Luis Scola – one of my all time favourite players – and Chris Copeland (maybe) have bolstered their challenge considerably. From the perspective of the Miami Heat, however, the key to Indiana’s potential title challenge remains Roy Hibbert. Hibbert scored 155 points and grabbed 73 rebounds (35 offensive) during the Eastern Conference series. Chris Bosh only pulled down 30 rebounds. Total. The Miami Heat needed someone to slow Roy Hibbert (not to mention Joakim Noah, or potentially Andrew Bynum if he ever gets his act together) in the event that they meet the Indiana Pacers in the 2013-2014 NBA playoffs. Hibbert basically did whatever he wanted against Chris Bosh, Chris Andersen or whomever the Miami Heat decided to put on him during their most recent championship run. Joel Anthony even had a go. What Oden, if he stays healthy (ever the caveat with Greg and one also applicable to Dwyane Wade), can give them is someone who might be able to come in and actually trouble Hibbert – already foul prone, even though he was guarding the perimeter oriented Bosh his 28 fouls led all players in the series – on both ends of the floor. If Oden gets himself to the point where he can actually play 15 or 20 minutes a game, that’s 15 or 20 minutes where Bosh isn’t being thrown around like a rag doll on defense. 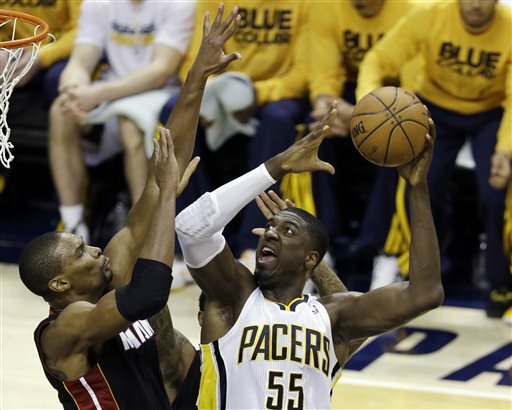 Hibbert’s four best career performances against Miami all came in the recent playoff series. He scored 29, 24, 23 and 22 with FG% of 67, 55, 62 and 57 in each. His career averages are only just above 11 points per game with a field goal percentage of 47. Fair to say he likes playing against Miami. The idea is that Oden could become the Heat’s countermove to Roy Hibbert, in the event that the sides meet in the 2013-2014 NBA playoffs. Of course there are other situations where he might be useful, but given the lack of other moves by Miami during the summer of 2013, it seems as though the view on South Beach is that the team is sufficiently well equipped to make it as far as the Indiana Pacers (or perhaps a Derrick Rose-inspired Chicago Bulls) and possibly further. Oden make that “possibly” a little more possible.